This townhouse near The Metropolitan Museum of Art will be completely renovated due to fire damage. Built circa 1899, the six-floor private residence is quite spacious (7,600 square feet), with ample family spaces, formal living and dining areas on the parlor floor, seven bedrooms and eight bathrooms. The owners have multiple residences, both here and abroad, and may choose to offer the townhouse as a rental property. Our clients came to us following unsatisfactory attempts to work with two other architectural firms. A trusted builder, with whom we’ve enjoyed a longstanding relationship, brought us together for an initial conversation that developed into a congenial working arrangement. We responded to our clients’ desire for an elegant, yet highly functional, home with designs that incorporate respectful nods to traditional touches with modern updates. Using BIM, a fully customizable, state-of-the-art 3-D modeling software, we transformed flat drawings into movie-like sequences to give the virtual experience of inhabiting each of the rooms. Project elements, from energy efficient systems to paint details and built-ins, to custom designed lighting and finishes are tracked in one system, assuring all architectural and mechanical intentions remain intact, start to finish. 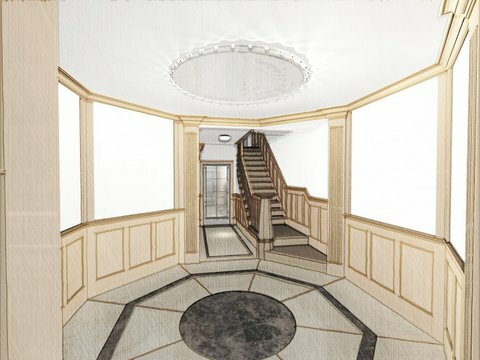 The ground floor is graced by a striking, formal, octagonal reception area, which leads to the elevator and flows into the stairway. This entrance provides access to the family room at the rear and is organized to facilitate formal gatherings on the parlor floor above. It provides discrete access to a separate service entrance to accommodate deliveries, family storage for strollers and bicycles, and other mudroom needs. The master suite was conceived to allow one person to conduct business at any hour without disturbing their spouse’s sleep. The suite, which occupies the entire second floor, features two distinct dressing areas and a study separated by the generous bathroom. One may circulate privately between the bedroom and study without using the common stair hall. The master bathroom has unique contours that utilize space behind the elevator shaft for double basins and a dressing table with custom designed lighting. A wet room with separate large tub and shower has a pitched ceiling that rises to a light shaft. There are two additional private floors, each with two bedrooms and en suite bathrooms. The top floor contains two staff bedrooms and bath, and a large room with a high ceiling that may be used as a gym or playroom. Convenient access to a roof garden rounds out the private attributes of this home. Construction is slated to begin in autumn of 2012. Click here to view more images of this project. Click here to see a selection of previously completed projects.